Anjon Manufacturing Professional Pond Kits are made with industry standard components. The new ASK-5000 and APF-16 are created with rugged materials built to last. They were developed for easy maintenance and installation. Between the mechanical and biological filtration, your pond’s water will be clearer and aquatic life will be much happier. We ensure the kit has everything you need for simple installation. The self-adjusting weir on the skimmer allows for surface debris to enter and collect in the basket, and discourages fish from entering. The large 16” spillway will make a stunning display in your water feature, pleasing to look at and listen to. With the variable speed controller you can control the flow of your waterfall. 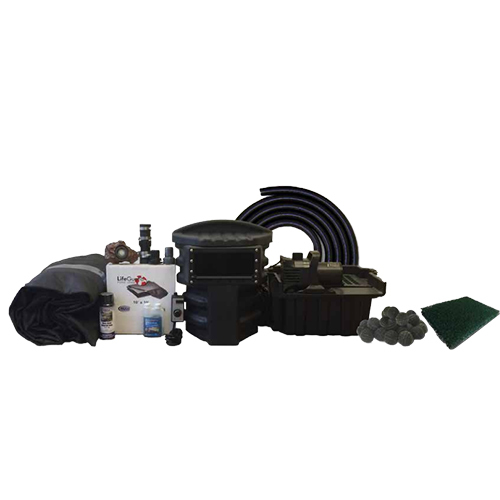 The Anjon Professional Pond Kits has all the basics you will need for a stunning water feature.